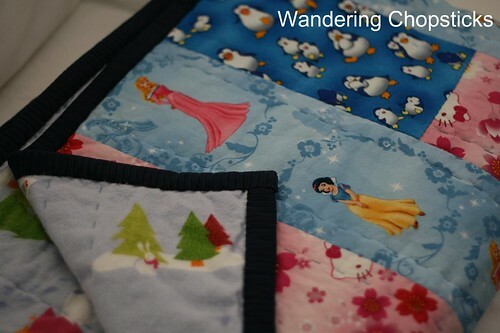 I've blogged how to bind a quilt before, but this is a slightly different method so I figured it deserved a separate post. 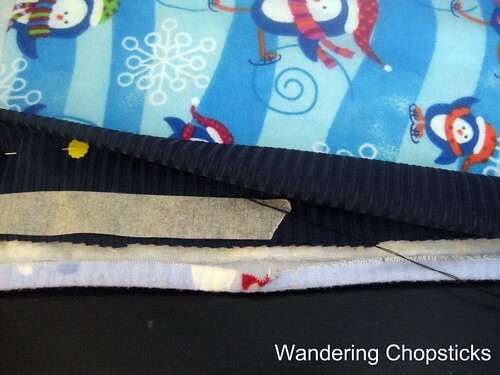 The binding, that strip of dark blue fabric all along the edges of the quilt, help keep the ends from fraying and gives it a nice finished look. 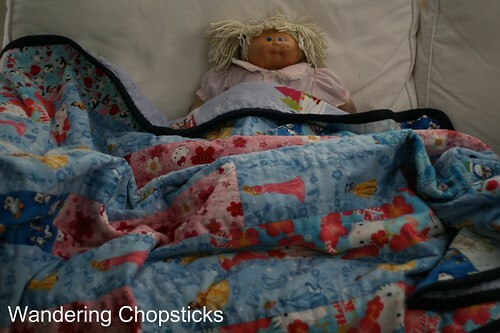 Or so thought lil' sis who marveled at how nice it made her Favorite Things quilt look. I cut my strips about 4 to 5 inches wide. 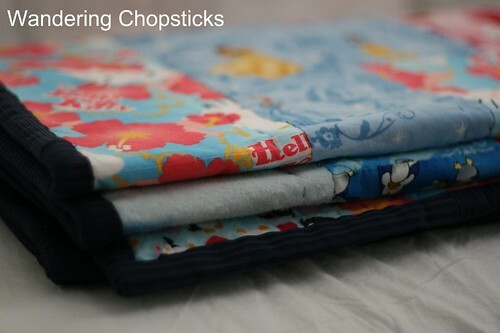 That's because they'll be folded in half, and then half again, so the finished binding will be about an inch or slightly more. Not too wide, but still workable. 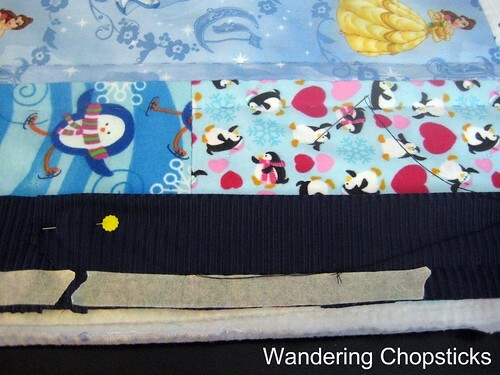 Some people cut the strip at a bias so that when the binding gets folded, the seams won't be bulky. I don't do it, so it's entirely up to you. 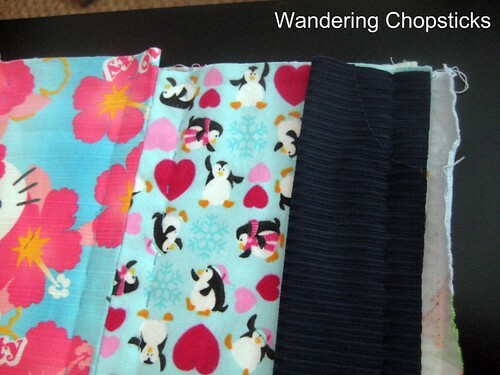 I like to use up remnants for the binding, and save my nicer fabrics for the main part of the quilt. Anyway, once you've sewn or cut up a bunch of strips, make sure it's long enough to run the length or width of your quilt. 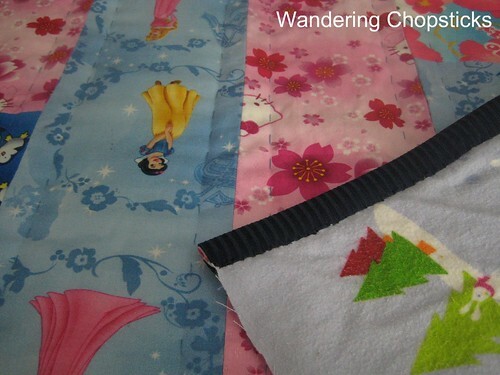 Fold in half and pin it to the edge of the front of your quilt. I use masking tape to mark off where I'll sew. Sew through all the layers of the quilt. Trim off excess fabric if you wish. I just fold it into the binding. 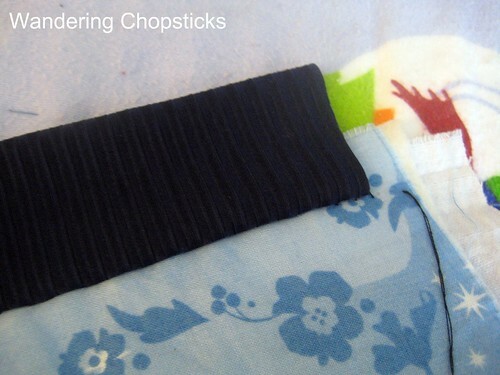 After you've finished sewing through all the layers down one side, fold the whole strip over so that it overlaps the back. See? 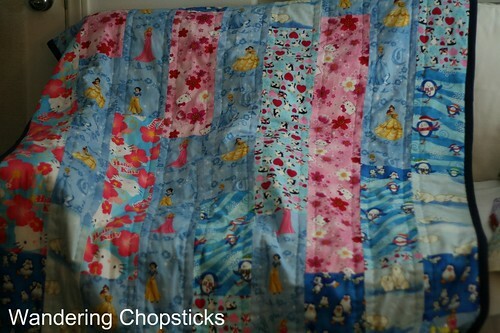 The front part of the quilt should be nice and straight with the binding. Fold over the back like so, lining up the edges with the sewing lines. 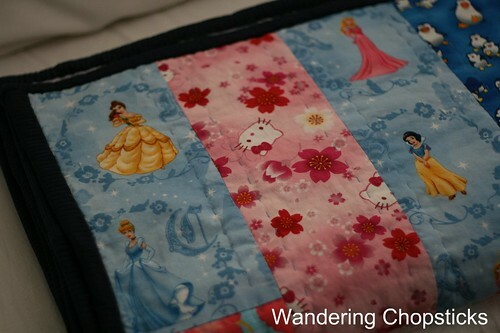 Then sew down the binding to the back of the quilt. And there you go, one finished side. 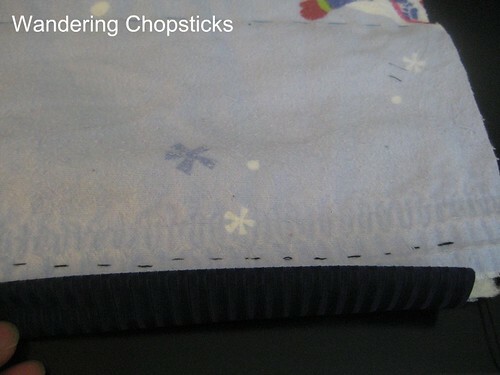 For the corners, make sure the other side is a little longer and just tuck the edges in before sewing it shut. You could try and make it at an angle as well, but that's too much work for me. 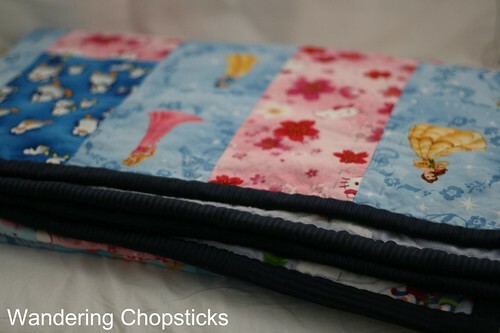 Even with random remnants sewn together, the binding still turned out rather nice. As you can see, the binding on the front and back match up nicely that way. 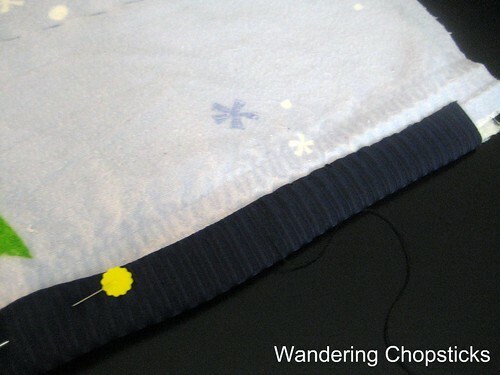 This way, there's also two layers of fabric so when the edges get frayed, the binding still holds strong. 2 years ago today, Blogger Prom - Andaz West Hollywood - West Hollywood. 3 years ago today, Mi Xao Don Chay (Vietnamese Vegetarian Crispy Egg Noodles). 4 years ago today, Vanille de Patisserie - San Marino.